It's AR-MO...come on, we're roadgeeks, we always go south to north 'cause the milemarkers do. On a serious note, describing roads in south-to-north, west-to-east fashion has been drilled into me by Wikipedia, which you may notice always describes US roads in this way, for this very reason. I have noticed that. And the main reason I've noticed is that I'm often scanning the exit list or regional breakdowns in a north-to-south fashion—meaning I have to start at the bottom of the wiki page and work upwards. Almost always: Except for I-5, Oregon starts their N-S highway mileposts (at least the US highways that extend clear across the state: 97, 101, 395) at thenorth end (i.e., at the Columbia River), with the highest mileage at the CA state line. Apparently this has been done since the state highway system was initiated, since most OR population centers were (and still are) located in the northern half of the state. Obviously, Wiki doesn't seem to recognize this anomaly! Illinois does mile markers north to south on state and US routes. But they reset at county lines. Hey, it's the Alphbets we all know and love! So they're going to have a shield with "Future" in the red field -- if those are to be freestanding "quasi-reassurance" signs, they're clearly stealing a march from NC! But since no other state has copied that method used previously on I-73/74, I'll wager that those shields will be attached to a BGS rather than following the NC practice. I thought Kentucky used those for I-69 southwest of Kuttawa, did they not? Gee -- never figured I'd be that prescient! Is that BGS (or more like a MGS!) located on the initial BV bypass lanes? There are also signs on future 49 near Barling. Regarding the corridor between I-30 and Future I-57: Doesn’t ARDOT have long-range plans to directly connect the two using dedicated lanes? How does it not connect? The two highways are connected by about 3 or 4 miles of I-40. A direct connection. I-30 could simply be signed along I-40 for this short distance then follow US 67 all the way to the end of the freeway. The new "I-57" may not connect with the real I-57 in Missouri in our lifetimes considering the money issues that Missouri is having. It seems like common sense would dictate signing it as I-30. I'm far more favor of the I-57 number than I-30. For one thing, the current route is US-67, a North-South route. I-30 is an East-West route. From the Little Rock area US-67 is carrying traffic primarily to destinations up NORTH. Not West. So an odd-numbered designation like I-57 would make more sense. And I do like the implied pressure numbering this route from North Little Rock to Jonesboro as I-57 would apply to bridging the gap to existing the end of existing I-57. It's a do-able thing and I think a project that is justifiable. It's going to be decades before I-69 is ever completed. So a lot of NAFTA oriented truck traffic coming up from Texas headed to the Northeast US is going to be taking routes like I-30 to Little Rock (and US-69 through Oklahoma to I-44) to get to those highly populated destinations. I-30 also follows US 67 south of Little Rock. Why not sign that segment as I-57? Look. US 67 is a diagonal route. No highway that follows the corridor is going to be perfectly north and south or east and west. The easiest solution would be to sign it as I-30. Arkansas originally wanted an extension of I-30 but they also knew that Missouri wanted I-57 instead and any extension of either number would ultimately require MO's cooperation. My guess is that AR felt they would have a better chance of getting MO to do their part if the extension was I-57 instead of I-30. Another thing is by having an I-57 extension, the Little Rock area (and the state in general) can claim that they have a single interstate designation that links them to Chicago. I'm sure that seemed much more enticing to AR leaders from an economic standpoint than I-30 once they really thought about it, which is probably what helped AR decide to ditch the idea of extending I-30. Any bets on when they'll start resigning US 67 at I-40 in North Little Rock? As in posting I-57 vs "Future 57"? I would think where new pavement would be laid would be posted with "Future I-57". No? Maybe when it's complete to Sikeston? Makes sense -- it's not like I-49 in NWA, where (a) there was an existing Interstate, and the action was simply a number change, and (b) it, like I-540 before it, connected an area with substantial population and equally substantial commercial interests to the rest of the Interstate system. Functionally, the existing Interstate-grade freeway portion of the I-57 corridor that could conceivably receive signage goes to a junction (US 63/412) and abruptly stops -- with the remainder of the corridor up to the state line and beyond in the very early planning stages; a specific alignment hasn't even been selected as of yet. It's a freeway to, if not nowhere, at least nowhere significant. If I were ARDOT, I'd hold off on any real 57 reassurance shields until at least that extension to the state line is finalized -- plus an agreement with MODOT regarding the remainder of the route to Poplar Bluff is solidified. Full signage is pointless until then. I have not seen [in person] (anytime recent) the current state of US 176 from the AR 440 interchange to where US 176 is dropped and continues as US 76, but from the looks of it (thanks to Street View) there could be a continuous 6 lane section. Off topic, but I just noticed we have virtually the same signature. It's weird seeing them back-to-back. I hate this "future" garbage on perfectly serviceable freeways destined for interstatehood. This is a 100+ mile freeway that's good-'nuff right now. I don't understand the "future" nonsense either. They should sign the Interstate quality stretch of US-67 from North Little Rock to Walnut Ridge as I-57. 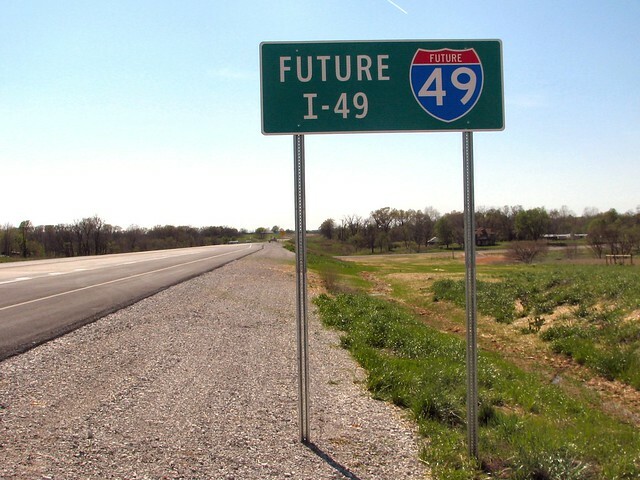 Put the "Future I-57" stuff on parts of US-67 North of Walnut Ridge near the Missouri border. In Texas there are small segments of freeway signed as I-69W, I-69E, I-69C, I-69 and I-369. None of those has a "future" tag applied even though the vast majority of freeway miles on those routes remains not built. Hell, the tidbit of I-369 in Texarkana may be removed with the eventual I-369 route built farther West. There are other disconnected segments of I-69 in Mississippi, Kentucky and Indiana. In North Carolina I-74 signed along 3 different disconnected portions of highway, and will likely never be joined with the original I-74 terminus in Ohio.